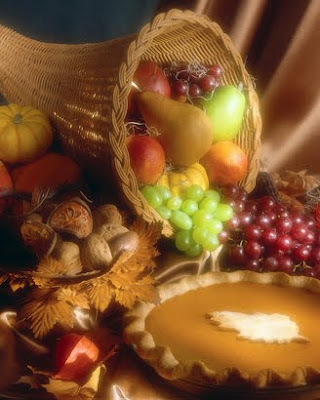 This coming Monday is Canada's Thanksgiving holiday, which makes this our Thanksgiving weekend. Time for family, friends and loved ones to get together, have a great time and eat the traditional turkey dinner. There are three traditions behind our Canadian Thanksgiving Day. * Long ago, before the first Europeans arrived in North America, the farmers in Europe held celebrations at harvest time. To give thanks for their good fortune and the abundance of food, the farm workers filled a curved goat's horn with fruit and grain. This symbol was called a cornucopia or horn of plenty. When they came to Canada they brought this tradition with them. * In the year 1578, the English navigator Martin Frobisher held a formal ceremony, in what is now called Newfoundland, to give thanks for surviving the long journey. He was later knighted and had an inlet of the Atlantic Ocean in northern Canada named after him - Frobisher Bay. Other settlers arrived and continued these ceremonies. * The third came in the year 1621, in what is now the United States, when the Pilgrims celebrated their harvest in the New World. The Pilgrims were English colonists who had founded a permanent European settlement at Plymouth Massachusetts. By the 1750's, this joyous celebration was brought to Nova Scotia by American settlers from the south.At the same time, French settlers, having crossed the ocean and arrived in Canada with explorer Samuel de Champlain, also held huge feasts of thanks. They even formed "The Order of Good Cheer" and gladly shared their food with their Indian neighbours.After the Seven Year's War ended in 1763, the citizens of Halifax held a special day of Thanksgiving.The Americans who remained faithful to the government in England were known as Loyalists. At the time of the American revolution, they moved to canada and spread the Thanksgiving celebration to other parts of the country. many of the new English settlers from Great Britain were also used to having a harvest celebration in their churches every autumn.Eventually in 1879, Parliament declared November 6th a day of Thanksgiving and a national holiday. And this is one of the funniest exchanges ever between Johnny Carson and Doc Severinsen (1979). They are talking about the US Thanksgiving, and boy, were they having fun. It is their laughing that makes me laugh more than what they are actually saying. Wishing all my fellow Canadians a Wonderful, Happy and Safe Thanksgiving Weekend! Happy Thanksgiving to you and yours Sue. Happy Thanksgiving to you, dear Sue! It was so interesting to read the history of Thanksgiving in Canada. I was also thrilled to read the proclamation by the Canadian Parliament, which was given 2 days after I was born in Alberta! Little bits of information like this about Canada always mean a lot to me. I had turkey stuffing and the whole nine yards tonight. I loved watching Johnny Carson with my folks when I could stay up that late... One of a Kind... Things were so much simpler then. YES the squirrels are so destructive. We have quite a feud going on with them also. People from the neighborhood feed the "cute" little things and now they are becoming aggressive... ARGH! Thanks for the history lesson It was really fascinating, and thanks for the laugh with Carson. I sure miss him, I actually watched him since I was a little girl. I would get up at 11:00 p.m. and the whole house was asleep and I would creep to the living room and watch his hour show. I was very young like 8 or 9 and would sleep in class I was so tired. And thank you for sharing the beautiful melody from George Winston. Happy Thanksgiving--I am sure there is much to be thankful for...and wishing your family the best! I did not know this, I needed the history lesson! Happy Thanksgiving to you and your family!